A sewer replacement project in Sitka has turned up more evidence that one of Alaska’s oldest cities has been inhabited for a long, long time. 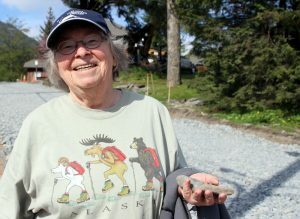 A stone tool — resembling a wedge, or striker — was unearthed in an excavation beneath a street in downtown Sitka, and may never have been found, but for a retired anthropologist who knew what to look for. The culprit proved to be Nancy Yaw Davis, who grew up on this corner. Davis’s father, Leslie Yaw, came to Sitka in 1923 to teach and coach at the Sheldon Jackson Training School. He became superintendent of the school in 1930, and president of the new junior college in 1944. Nancy, now 81, lived on this corner for 16 years. “This little stretch from here to Etolin Street was owned by Kettleson,” Davis said. It’s significant that this place is alive with memories for Davis, even though we’ve met here to discuss something made by people long dead. Less than a stone’s throw from where we’re standing are petroglyphs — prehistoric rock carvings — of unknown age and origin, right in the middle of downtown Sitka. So many people have lived, grown old, and made their own memories on this spot. For an anthropologist, finding a stone tool was almost unavoidable. “And my line is: I came looking for my childhood marbles, and I really lost them that morning when I found this,” Davis said. The object itself resembles a modern wood splitting maul or wedge, except it’s got three faces instead of four. One end is squared off, where you might hit it with another stone. And it does look like a rock. The artifact is nondescript to the untrained eye. I would have walked right by. Davis noticed it because it was a different type of stone than the gravel piled all around this road project. Just a block away is the Sheldon Jackson Museum — and it’s got a small collection of stone tools, some of which resemble the one Davis has discovered. Curator Jackie Hamberg thinks it might have had a utilitarian purpose. Archaeology is not always what people imagine it is: Indiana Jones exploring an ancient, cobwebbed temple. A lot happens out here on construction sites. But not this one. Although Nancy Yaw Davis has worked as a contract archaeologist for a similar project just a few blocks away, the state doesn’t think one is necessary this time. Judy Bittner, head of the State Historic Preservation Office, says the soils under street projects are often too disturbed to allow for careful archaeology, where everything around the artifact — known as “context” — is just as important as the object itself. “And if it’s just sort of random artifacts, you know bottles and things that were part of the detritus of the living population there, and you know what to expect and you already have information from it, and you’re not really going to gain new information about that settlement or the occupation or the time period in history,” Bittner said. Davis knows this as well as anyone, but she’s still a little bit irked. She sees artifacts almost everywhere she goes, and believes there is an important human story literally beneath our feet. Objects like this stone striker — though useless to archaeology in the strict sense — represent a cultural richness that modern society doesn’t fully appreciate. “And I think that we should assume that there were people here, throughout this magnificent area, and there is evidence of them if we learn together how to recognize it,” Davis said. And she wouldn’t mind if the field of Archaeology were a little less territorial. Yet another reason for Sitkans living near major sewer projects to keep the police on speed dial.